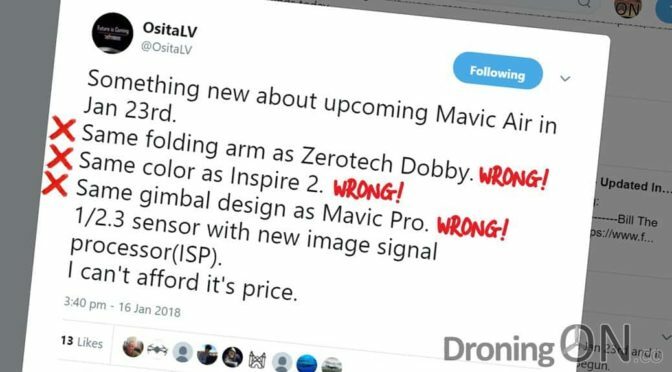 DJI consumers are continually desperate for information on future drone models and an anonymous Twitter account under the name of ‘OsitaLV’ is taking full advantage, but the ‘insider information’ tweeted so far has all proven to be misleading and incorrect. 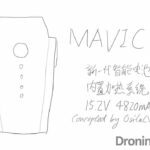 This year saw the release of the DJI Mavic Air, a smaller but very capable drone to join the impressive DJI model line-up. 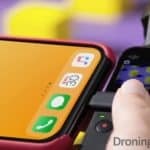 The build-up to this product launch was shrouded in secrecy and very few genuine details were leaked until a week prior to the launch, but a Twitter account named ‘OsitaLV‘ was publishing what would appear at the time to be real ‘leaked’ information. 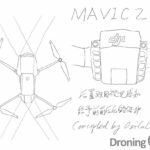 On the 23rd January, the launch date for the DJI Mavic Air, OsitaLV tweeted a self-congratulating statement suggesting that his speculation had been correct in every respect. His tweet arrogantly suggests that his followers call him a ‘seer’ (a person of supposed supernatural insight who sees visions of the future) and a ‘prophet’ (a person regarded as an inspired teacher). 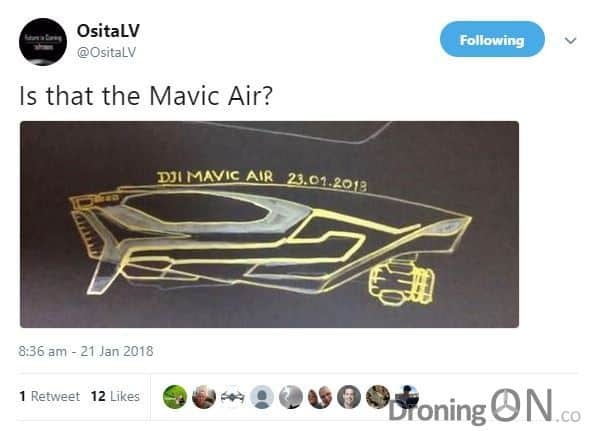 With the DJI Mavic Air launched on the 23rd January, we can now evaluate the post from OsitaLV, revealing that the majority of it is misinformation. 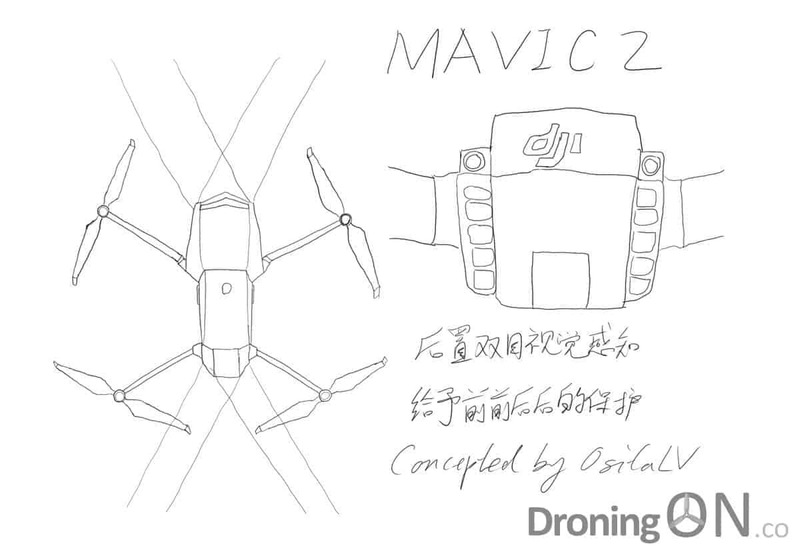 Statement 1 – INCORRECT: The folding arms of the DJI Mavic Air are entirely different to those of the ZeroTech Dobby, there is no similarity at all besides both mechanisms using a hinge. 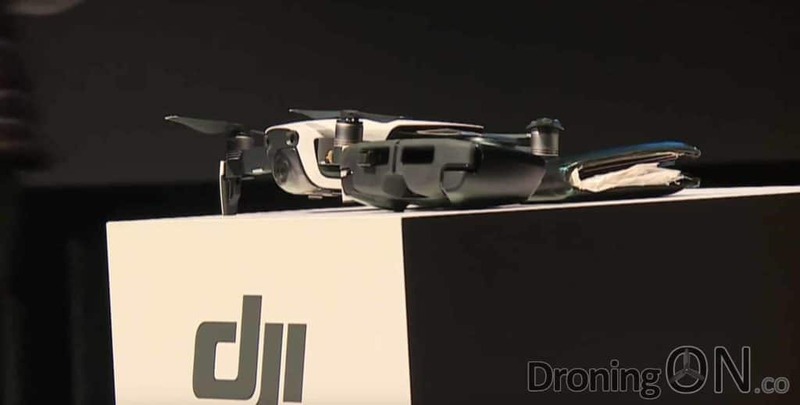 Statement 2 – INCORRECT: The DJI Mavic Air is available in three colours, not just black as per the DJI Inspire 2, and the black tone is different. 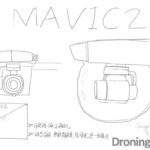 Statement 3 – INCORRECT: The gimbal design of the DJI Mavic Air is entirely redesigned and shares no similarity with the gimbal of the DJI Mavic Pro. Of the four statements made only one is correct, therefore this tweeter is incorrect to state that his predictions were accurate. 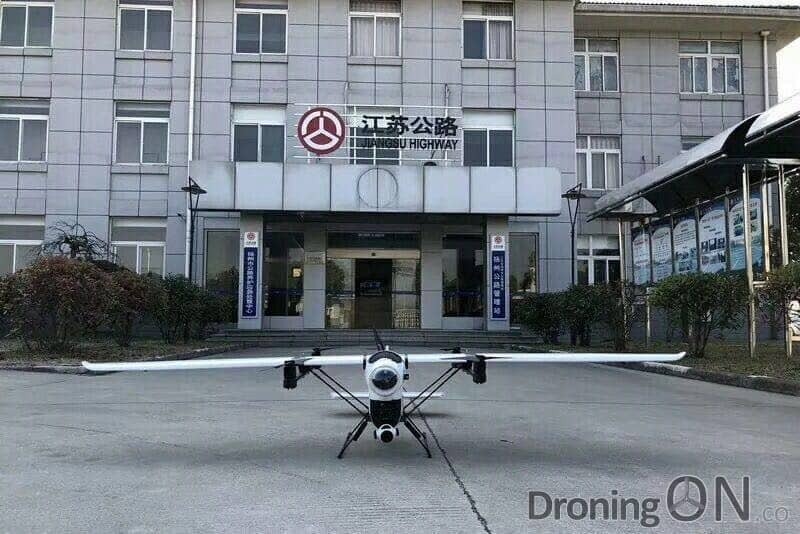 The account has also tweeted photos of drones prior to release but this media has not been sourced by OsitaLV and the account fails to give credit to the original sources. The following example was tweeted but did not include the original source, a YouTube video not associated with OsitaLV. 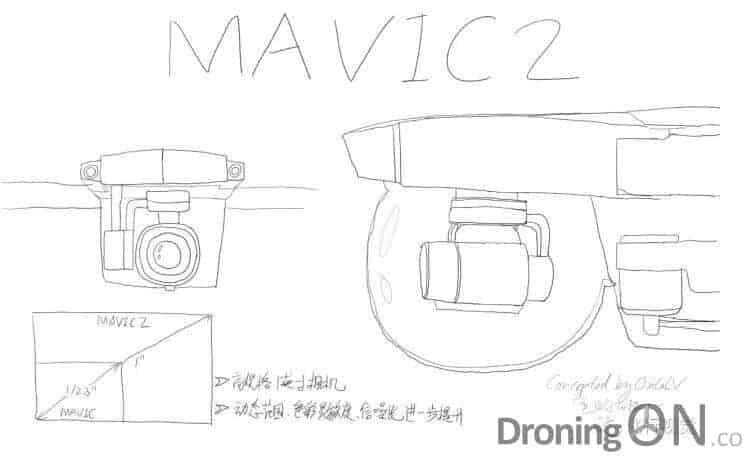 An image posed by the OsitaLV account but failing to give credit to the creator of this concept drawing, published a day before the Mavic Air launch. Speculation on forthcoming drone models is welcomed from industry insiders and professionals but this Twitter account continues to publish statements as fact, which are then proven to be incorrect. 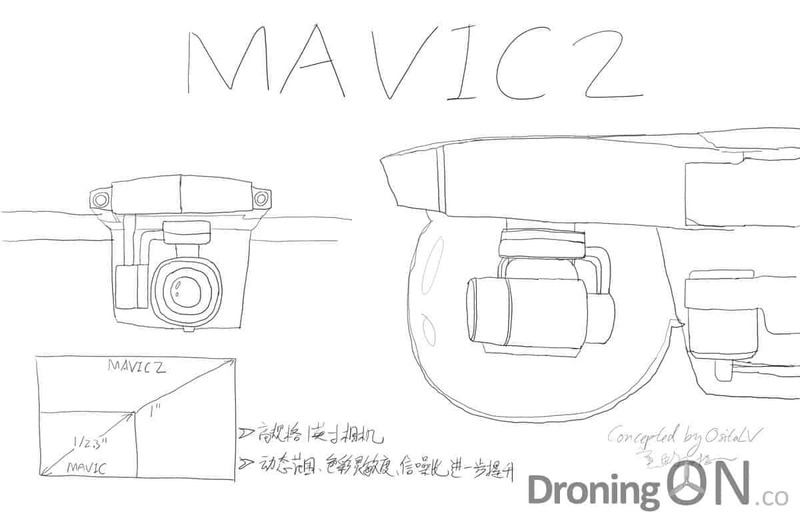 The DJI Mavic Pro 2 will be named ‘DJI Mavic Pro II’. 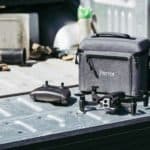 Larger props and motors than the original DJI Mavic Pro. Over 30 minutes flight time, 32 minutes maximum. Will not use a mechanical camera shutter. 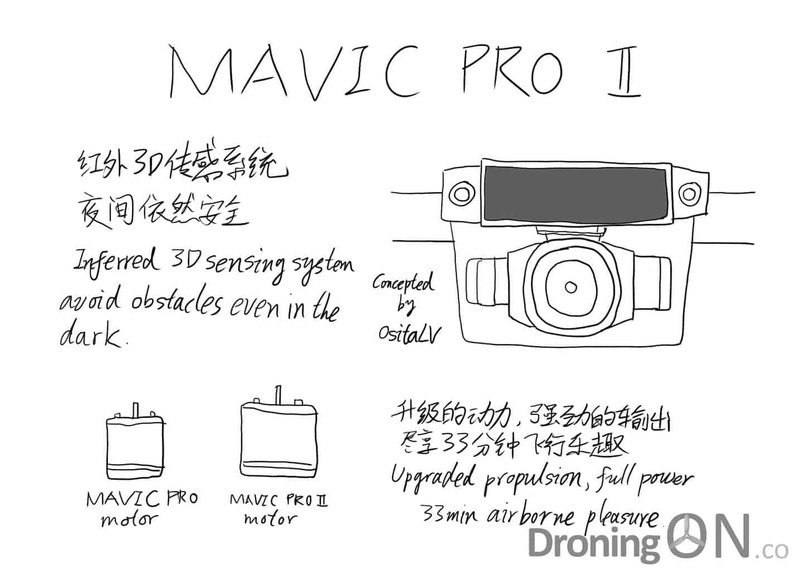 Will feature a 1″ camera sensor, “99% positive” he states. 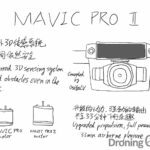 It will contain the internals/specification of the Phantom 4 Pro. 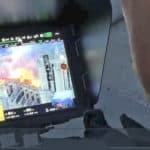 Would be released late March to June earlier than Phantom 5. Top speed of 72kph in sports mode. No rear obstacle avoidance, but he then changed his mind to state that it will feature rear obstacle avoidance. 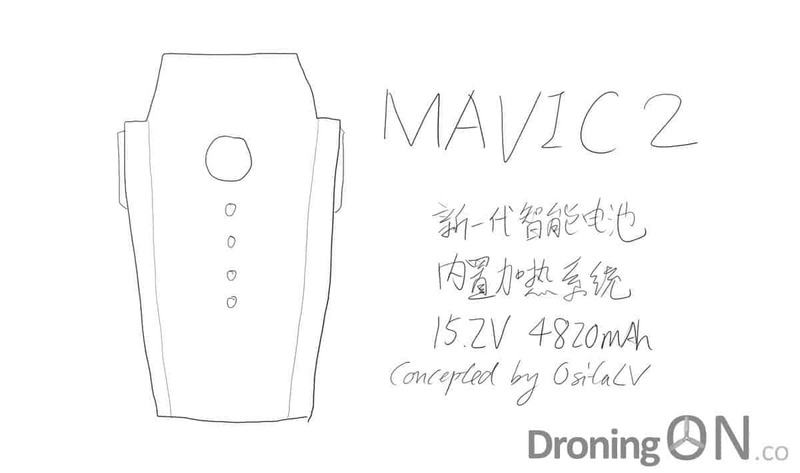 Same transmitter as the original Mavic Pro. Larger battery (4820mAh) and 15.2v instead of 11.4v. Will use OcuSync transmission technology. 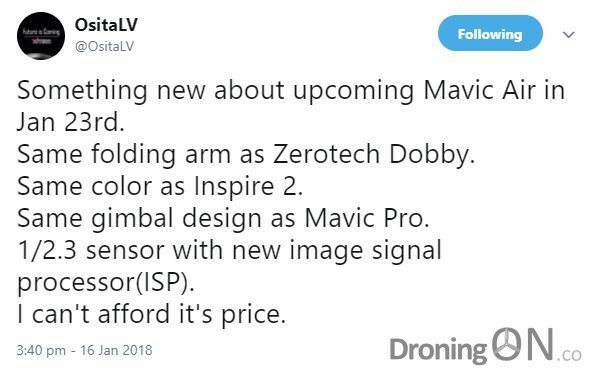 Mavic Pro 2 may have a variable iris F2.8-F11. 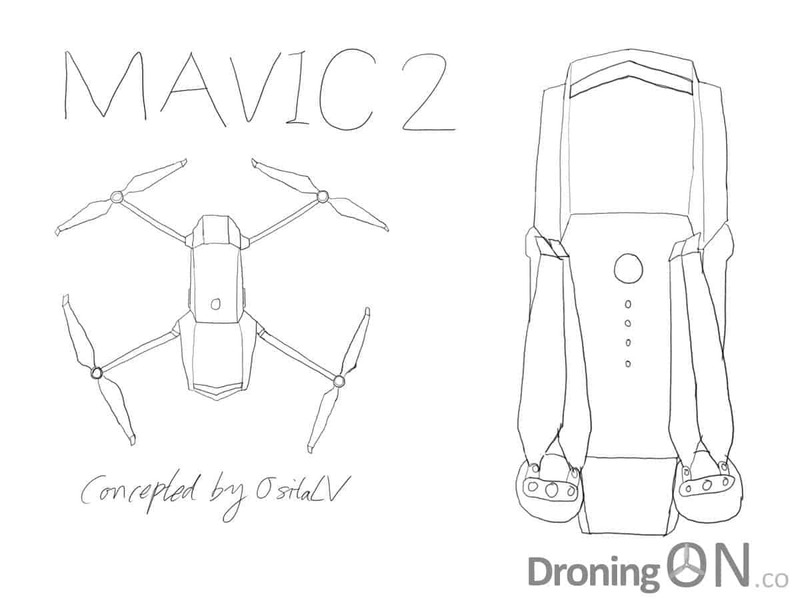 OsitaLV has been frequently deleting tweets which are later proven later to be inaccurate, we will therefore be using the above if the DJI Mavic Pro 2 is eventually launched. A number of drawings have been created by OsitaLV which subsequently have been reproduced by tech-blogs and video-blogs as ‘leaked facts’. 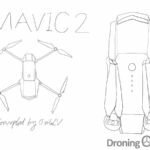 OsitaLV was quick to jump on the news that DJI might be launching a VTOL fixed-wing drone prior to the news being officially confirmed. Pictures emerged via Kanzhaji which were shared by the OsitaLV account but once again without providing credit to the source. The DJI VTOL drone concept, built by a third-party using DJI components. Shortly after he tweeted the following which suggested to his followers that he had inside information concerning the next version of this VTOL drone. 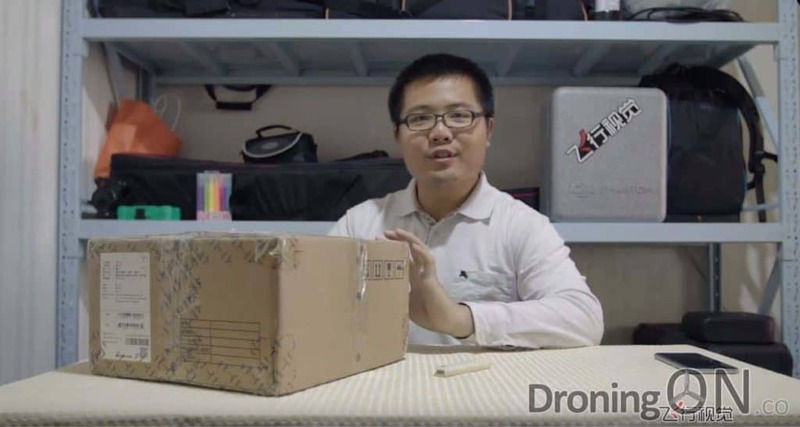 Later that day two tech-blogs, WeTalkUAV and DroneDJ, both dispelled the rumours following official confirmation from DJI that this was not a product and instead was a third-party build using DJI components. This demonstrates the stretch of OsitaLV’s imagination, not only wishing to be part of a speculated leak but also to suggest that he knows more, when actually the initial news is bogus. Whilst the tweets posted by OsitaLV should be harmless, consumers and even some desperate video blog channels are taking every word as fact and recklessly distributing the information and drawing/sketches as ‘official leaks’. Such misinformation is prompting consumers to hold-off from purchasing on the belief that the next model will arrive imminently. The dealer also gave details of the raw financial impact prompted by consumers believing the leak stories, originated by OsitaLV. 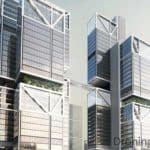 We do not know the identity of the user behind the OsitaLV account, some have speculated that he works for DJI but the inaccuracy of his predictions would suggest otherwise. Who is OsitaLV, owner of DJI twitter speculation and rumour account. Prior to October 2017, the account simply shared videos from the MagicCam YouTube channel, it is assumed that he works for this company. 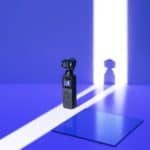 The MagicCam YouTube channel features a number of unboxing videos featuring one individual as the presenter, this could be OsitaLV. A competent and professional drone pilot in the industry would not attempt such a risky flight with a new drone in such a location. OsitaLV would appear to be just another regular consumer with a vivid imagination and a need for attention. The danger is that his social following is increasing whilst his speculation becomes more and more inaccurate. Free-speech permits the right to speculate on product launches but we suggest that the use of terms such as “it will” and terminology which proposes ‘fact’ should be avoided by this tweeter, instead ensure that tweets are clearly opinion and concept only. What are your views on this Twitter account and the speculation posted by it? Comment below with your thoughts. Join the friendliest DJI Mavic Pro group on Facebook now, over 30,000 members and growing by the day – join now!